"A penny saved is more than a penny earned." Through constant training, Sewa Bank inculcates the habit of saving to its member. Sewa Bank lays great emphasis on savings, more so when its clients are all self employed women with low income. Also, from an institutional view point, building a credit loan fund from members very own savings is cost effective. 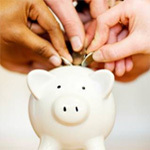 A wide range of different saving schemes are available for members.